What's common between the Nipah virus disease that struck in 1999, Severe Acute Respiratory Syndrome (SARS) in 2002, the recent outbreaks of Ebola disease and the Middle East Respiratory Syndrome (MERS)? Bats. 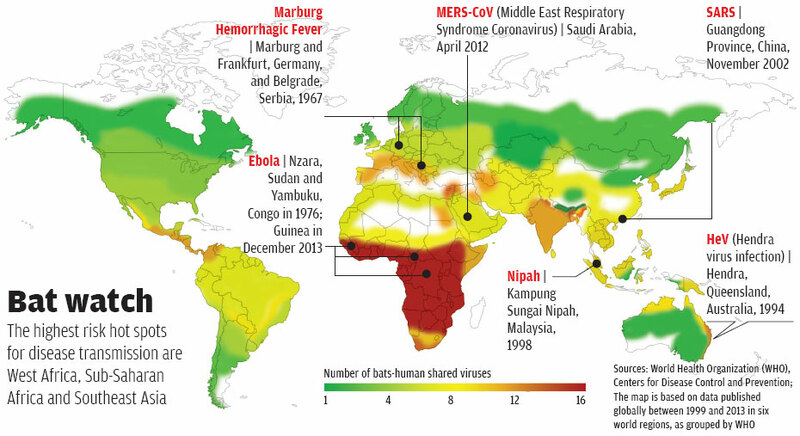 Scien-tists have now come up with the first-ever map showing areas where large number of viruses are present in bats, and where transmission to humans is possible. Classified as zoonotic diseases, they have become a significant threat to global health. The map, prepared as part of a study by the Centre for Biodiversity and Environment Research, University College, London, indicates that 60-75 per cent of the reported emerging infectious diseases in humans can be zoonotic. The highest risk hot spots for disease transmission are West Africa, Sub-Saharan Africa and Southeast Asia. India is at high risk. Phylogenetic analysis shows bats to be more ancient hosts of these viruses (they were infected much longer ago in time) than anyone expected. Zoonotic transmission is dictated by the presence of virus in the environment (or ‘richness’), opportunity of virus to transmit to humans (usually via bat-human contact), and human infection. The study, published in The American Naturalist on January 5, 2016, categorised environmental conditions and human activities to map whether they influence richness or contact with bats. The researchers mapped the potential distribution of 33 viruses shared between bats and humans. They made separate risk maps for richness and contact—to distinguish areas that are at high risk as they have a naturally high diversity of viruses, and those that are at high risk because there’s huge potential for contact between bats and humans (see ‘Bat watch’). The map shows that places where wild bat populations host viruses do not seem to be the same places where people frequently come in contact with bats. And both contribute to risks in different ways. Kate Jones, who led the study, says there is a large risk hot spot in Sub-Saharan Africa, including West Africa, where the recent Ebola virus outbreak occurred. Central and South America are also risk hot spots because of the presence of natural high diversity of viruses. “In contrast, South and East Asia seem to be risk hot spots because of the potential of high bat-human contact, a reflection of high densities of humans and domestic animals, as well as bush-meat practices,” says Jones. We are seeing hot spots for emerging diseases where there are increasing populations of both humans and their livestock. This is a result of settlements and industries expanding into wild areas such as forests, and this is increasing contact between people and bats. People in these areas may also hunt bats for bush meat, unaware of the risks of transmissible diseases which can occur through touching body fluids and raw meat of bats, says Liam Brierley of the Centre for Immunity, Infection and Evolution, Institute of Evolutionary Biology, University of Edinburgh, the UK, who is the first author of the study. However, P Jambulingam, director, Vector Control Research Centre, Puducherry, rules out the possibility of bush-meat consumption in India. “We only know the number of cases due to viruses transmitted from bats. But how the transmission of viruses happens from bats to humans is still not known,” he says. Brierley explains that this anomaly could be due to shortage of data on spatial patterns in bush meat hunting. “The bush meat layer in our model is sourced from one study, which reviews countries where any bat bush meat hunting occurs. India is included in this due to hunting of the flying Indian fox (Pteropus giganteus) in south India.” This could be relatively minor and unlikely to be a major source of zoonotic transmission and better data on which human populations hunt bats for bush meat would improve the accuracy of bush meat inputs to future models, says Brierley. “Yet India represents a hot spot for bat-human contact as the other significant factors in our model for increasing risk of bat-human contact were human population density and populations of livestock (represented by populations of domestic pigs). Certain areas of India may rank very highly for both these factors, although these are more general than bush meat hunting, and may represent a number of transmission mechanisms,” says Brierley. “Nipah virus, Hendra virus, SARS coronavirus, and most recently, the MERS coronavirus have emerged in the last 20 years, which reflects the accelerating speed of global changes in land use and demography as many industries are either expanding into or removing bat habitats. Modern travel networks and infrastructure can increase the spread of viruses to new regions, as was the case with SARS, adds Brierley. “We will delve deeper into the specific connections between bats and people in the future, which could help prevent disease outbreaks. Though there is much we are yet to understand, what is clear is that bats should not be vilified for their association with emerging diseases, as they are key contributors to environmental stability and ecosystem services. Admittedly, they’re fascinating animals, whose world we’ve only just ventured into,” adds Jones.